My work is about balance: how opposite or contrary forces complement each other and become awe-inspiring and beautiful. At times, these forces remain independent of one another but more frequently they become intertwined, indistinguishable, and connected. For me, this balance begins in the creation process by layering non-controllable paint applications like pouring and dripping with more controllable techniques such as using hand cut stencils or classical oil applications. Balance is also mirrored in the mediums used to create my paintings. 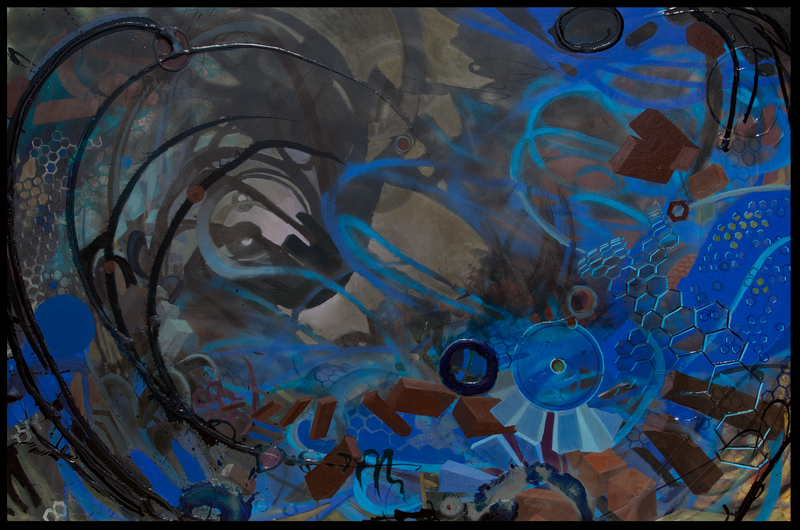 Shellac, resin, and spray paint create chaos; while acrylic, ink, and oil paint create order. As the painting creation progresses and a dialog between the painting and myself is established, I coax (but not dictate) the imagery to communicate dualities of triumph vs. tragedy, light vs. darkness, and most importantly order vs. chaos. J. Jordan Bruns lives and works in the Washington, DC area and has been the resident artist in the Chautauqua Tower at Glen Echo Park, Maryland for ten years. In 2004, he received BFAs in Painting and Illustration at Maryland Institute College of Art. He then went on to earn an MFA in Studio Painting at Indiana University in 2007. He currently manages and teaches at The Yellow Barn Studio and Gallery, at Glen Echo Park in Maryland. 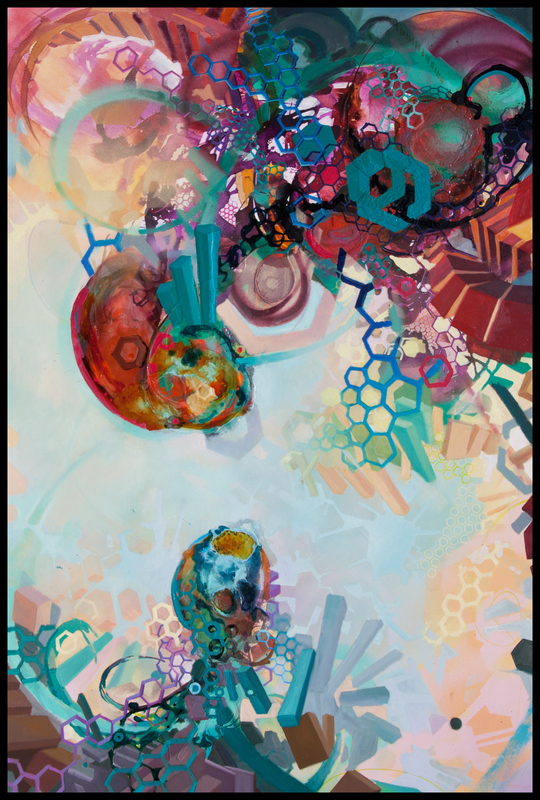 His work is in the public collections of Novartis Pharmaceuticals and Kaiser Permanente. 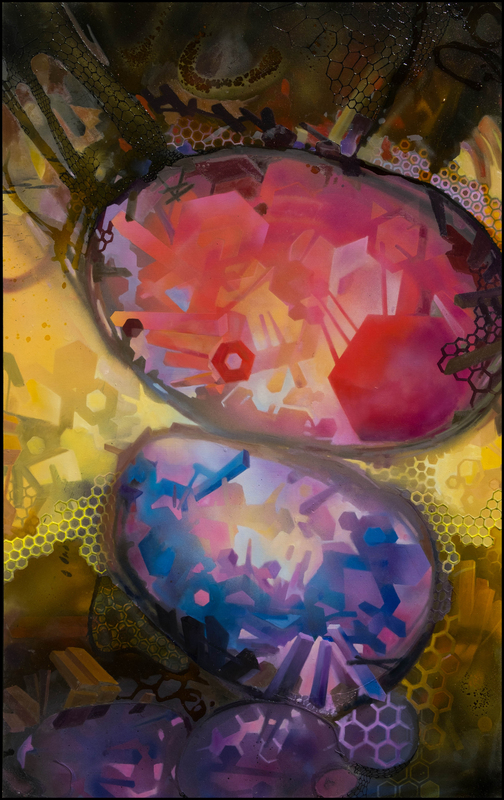 Solo exhibitions include Long View Gallery (Washington, DC) and The Indiana University Art Museum (Bloomington, Indiana). 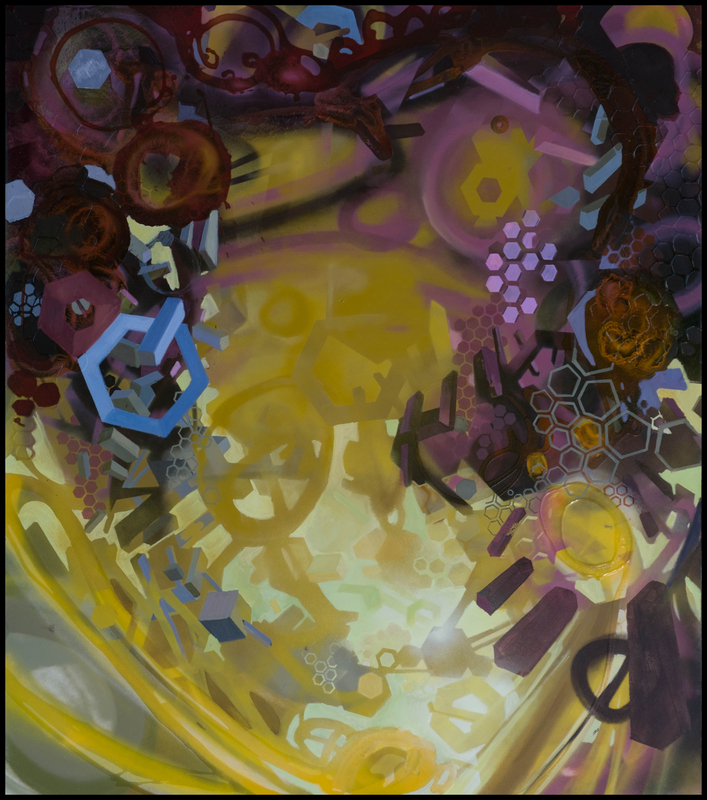 His numerous group shows include “Transient Geometries” at The Antelope Valley College Art Gallery (Lancaster, California) and “Color Schooled” (Long View Gallery, Washington, DC). 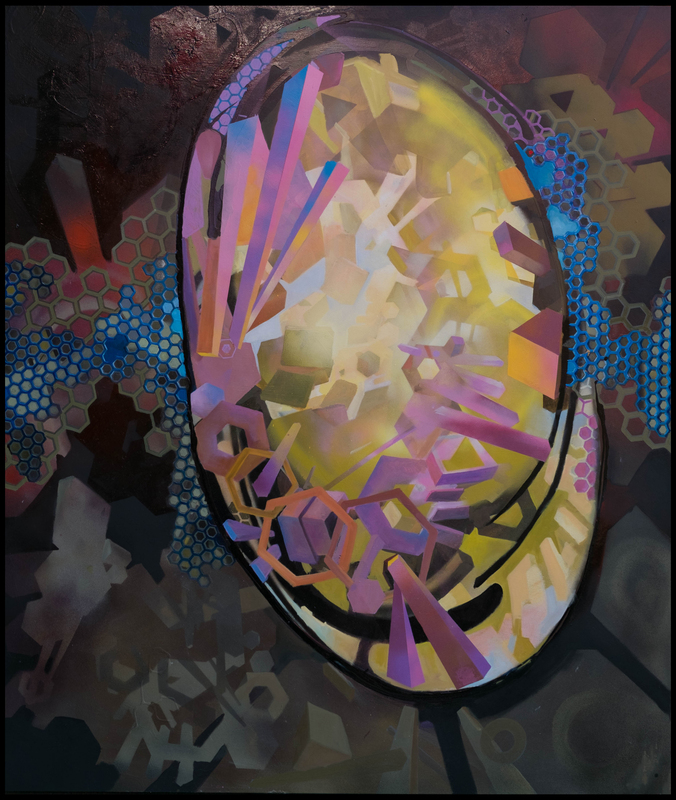 His work has also been exhibited in Scope Miami in 2014, as well as Context Miami in 2017 during Art Basel. 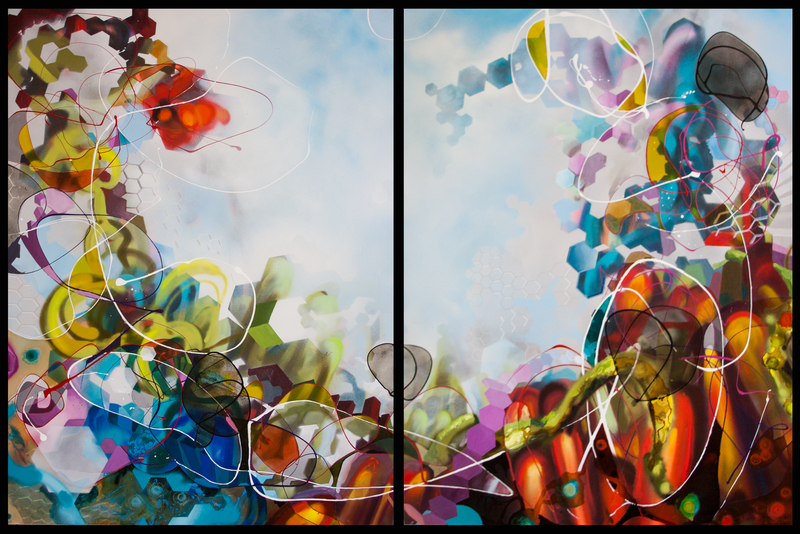 He is represented by Alida Anderson Art Projects (Potomac, MD) and Long View Gallery (Washington, DC).